LIVINGSTON leaves a lot to consider. 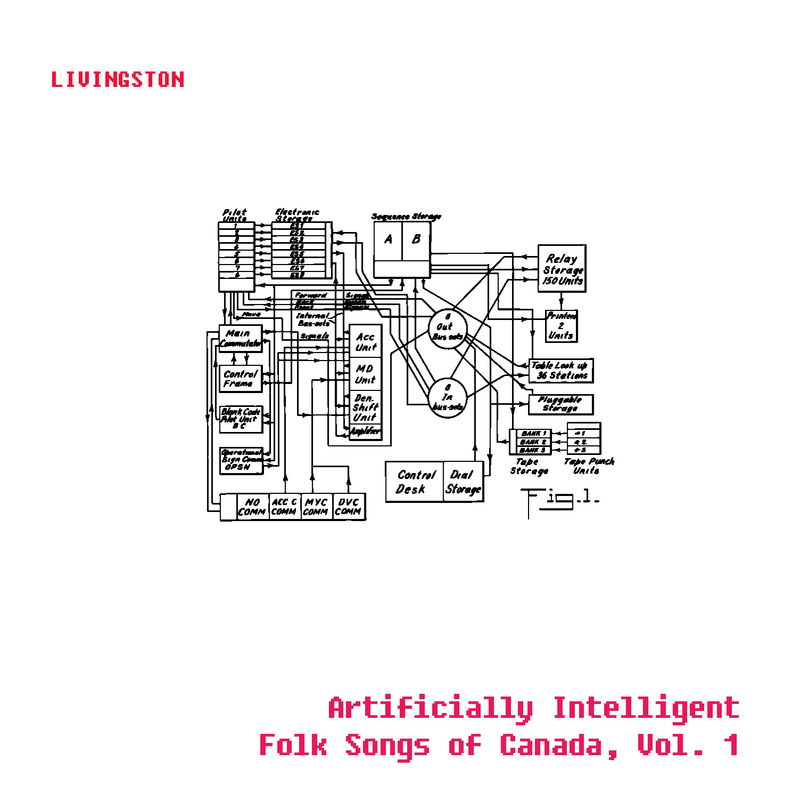 Supposedly, LIVINGSTON is a machine that was programmed by Henry Adam Svec and Mirek Plíhal to access the vast resources of Canada’s folk music heritage and generate new, “hyper-authentic” folk songs based on its knowledge. To continue the mythology, LIVINGSTON can only create notations and lyrics, and so Svec formed a band to play the material. Whether LIVINGSTON is an actual thing or a fun gimmick is almost beside the point—it’s provocative, as it deals with two juxtaposed ideas. On the one side, there’s folk music, which is often done with organic instruments and drawn from human experience. On the other, there’s technology, which seems almost the antithesis of folk. As for the songs themselves, they are performed by a pretty sweet backing band including Bruce Penisula’s Misha Bower on backup vocals, J.J. Ipsen on a whole bunch of instruments and Octoberman’s Marshall Bureau on drums. With Svec, (plus a great cast of backup musicians) it equates to a pretty awesome experience. The song titles mask how great these songs are, starting with “I Am a Weary Immaterial Labourer in a Post-Industrial Wasteland.” It slowly comes to life as Svec begins by singing “I am a lonesome idiot,” before gradually bringing in organ, Bower’s vocals, and a a wicked group chorus punctuated by loud stomps. While “Instructions to Your Integrated Circuit” and “Winter is Cold and Good” are abnormal song titles, they are also fairly straightforward but sweet little numbers, the former going sparse with just Svec’s vocals and guitars and the latter a wistful sendoff to the collection, punctuated at the end by keys. The second last song, “Take it Easy But Take It to the Limit” is none other than a cover of the Eagles’ “Take It Easy,” which raises the important question of how LIVINGSTON just happened to create this song by mining Canada’s folk database. But either way, the cover is a delightfully folky cover of the song with the added benefit of banjo, which really should have just been in the original version for extra awesomeness. The energetic peak of the collection is “S/He is Like the Angry Birds,” a song which has little to do with launching birds at structures in order to crush pigs. It’s actually a powerful number raised high thanks to the liberal use of saxophone and keys, as well as some very clever (and bitter) lyrics. Whatever LIVINGSTON is supposed to be, s/he writes stupidly good folk music.